« Pruning Euonymus – How and When? 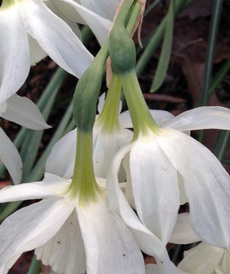 Spring blooming bulbs are the colorful messengers that spring has finally arrived. But for me, it is the wonderful daffodils with their bright yellow “trumpets” that truly signal the coming of the new spring season. The great thing about daffodils is that they are available in a tremendous diversity of colors, forms, and sizes. According to the American Daffodil Society, there are over 25,000 registered cultivars of daffodils! Choosing which bulbs you want to grow may be the hardest part of growing them! Daffodils are among the easiest of all plants to grow. They are reliable bloomers year after year as long as they are provided with sun, good drainage, and a little food every year. Planting daffodils in the fall is a great project for “little gardeners” because they are not only easy to grow but they make wonderful long-lasting cut flowers for the first colorful bouquets of spring! But what about after the show is over? The care you give your daffodils after the flowers fade can have a major impact on the flower show they provide for you the following spring! 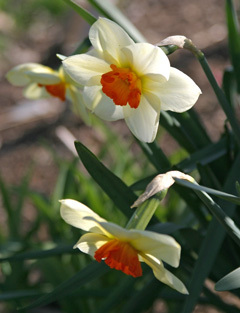 After your daffodils have finished blooming, fertilize them with Espoma Bulb-tone according to the label directions. The plants need to replenish their energy stores in order to produce new flower buds for next year. 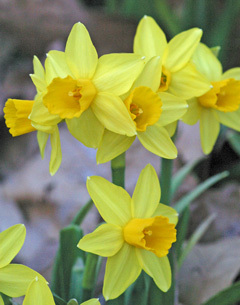 You may be tempted to cut the daffodil foliage back after flowering to neaten the garden. Do not succumb to this temptation! It is very important to leave the foliage for at least 6 weeks after they finish blooming. This gives the plant enough time to produce its own food through photosynthesis. The carbohydrates formed through this process will move down to the bulb and provide energy for growth and the production of flower buds for next spring’s beautiful blooms. Never tie or braid the daffodil foliage after blooming because this will interfere with photosynthesis. Often by the time the daffodil foliage begins to fade, other perennials in your garden will have grown up to hide the yellowing foliage. Once the majority of the foliage turns brown, you can carefully pull it off or cut it back. 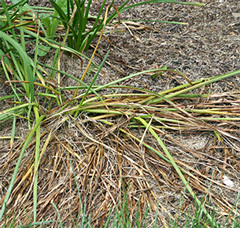 Should you deadhead the faded daffodil blooms or completely remove the old flower stems? There are different opinions about this. Some say yes, some say no, and some say it doesn’t matter. Why would you bother to deadhead? Have you ever noticed a large swelling at the top of the stem right behind the spent daffodil flower? 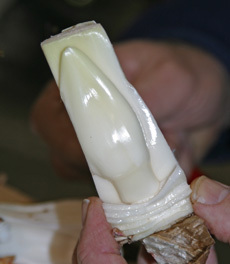 This is a seed pod which forms when a daffodil flower has been successfully pollinated. 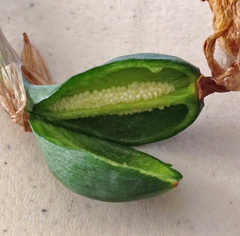 It takes energy to produce these seeds; energy that could be going to the bulb to produce next year’s flower buds. If you remove the shriveled flower and the seed pod behind it, then all nutrients will be channeled to the bulb and none will be “wasted” on seed production. 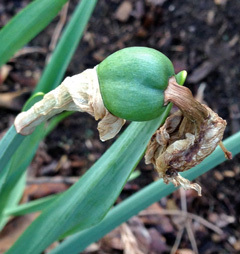 Wasted – unless you actually want the seeds in order to produce a new hybrid daffodil. Then you would let the seed pods mature, collect the seeds once the seed pod turns brown, and plant them out. However, it usually takes at least 5 years before a seed grown daffodil is old enough to produce a flower! As far as completely removing the flower stem – you could, but what color are the stems? Green! Personally we always leave everything; leaves, stems, and seed pods. Our daffodils bloom beautifully year after year! Actually, that’s not completely true. Daffodils make wonderful cut flowers, so we always cut a bunch of daffodil bouquets throughout the season to bring some very welcome spring color and fragrance indoors! Until next time – Happy Spring! We never have daffodils left to deadhead–my wife picks them as they mature and brings them in the house for their final days. Two birds. One stone.